"The right tool for the job." I don't know who first said that, but ain't it the truth. The right tool can make all the difference in the world. Take garden hoes for example. Who loves to hoe, raise your hand. Let's face it, hoeing is work, backbreaking work, especially with an ordinary garden hoe. 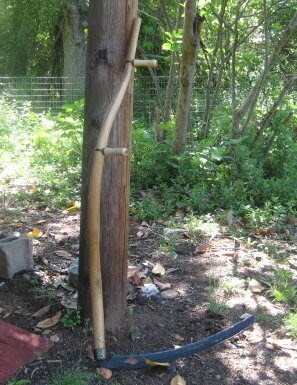 Back in my commune days, we had different hoes; heavy, large bladed hoes that made the job so much easier. 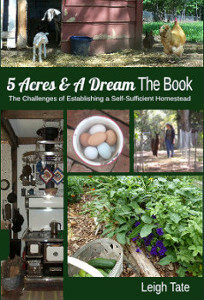 Since we' moved to our five acre homestead, I've been looking for one. The problem was, I didn't know what they are called. The only name I'd heard was a rather rude one, and I knew they weren't sold under that. 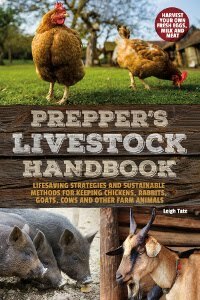 I finally found what I was looking for when I read this post over at Farm Folly. Not only did Lee and Robin have the hoes, but gave a link to where they bought them (EasyDigging.com). I found out that what I was looking for is an Italian Grape hoe. I ordered one immediately, and a 6" grub hoe as well. That's the grape hoe blade on the left. It makes productive weeding and cultivating so much easier. The one on the right is the grub hoe. It's perfect for trenching, turning soil, and making new garden beds. They are both heavy duty and reasonably priced. The other thing we bought, which DH wanted, was a snath and scythe. Usually, the entire tool is referred to as a scythe but technically, the scythe is just the blade. This one is a 30" grass scythe. 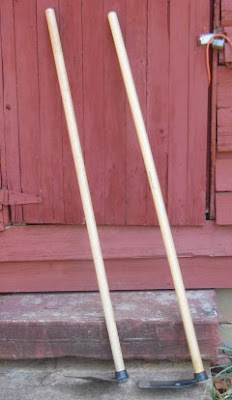 The long wood handle is called the snath. This is an American type, though there are European ones as well. The European models have straighter snaths. Why did he want one? Well, we love hand tools. Not that we don't have battery and gas powered ones which we use regularly. There's just something peacefully quite and calming about using hand tools. Something that seems to connect the tool user with the material being worked on. With something like scything, it's almost like a meditation. Handspinners, you know what I mean. Slower? Maybe. However, it seems that the more sophisticated and technically complicated a tool becomes, the costlier it becomes to operate and maintain in terms of both time and money. If we calculated all the time DH spends fixing the lawn mower including running to the store to buy parts, then definitely the scythe does a faster job. Add to that trying to get replacement parts at a reasonable cost and rising fuel prices. It all adds up in the end. Using it is an art and takes lots of practice, as you can imagine. We found a couple of really good videos on YouTube, along with some not so good ones. Understandably, the neighbors think we're a little nuts. No, we haven't gotten rid of the lawn mowers, because each tool has it's place. The tall grass would bog a lawn mower down, while a snath and scythe wouldn't do on short grass as for a weekly mowing of the front lawn. Actually the end goal is to eventually have no or very little lawn. Over the next several years I plant to turn our front yard into an extensive herb garden, starting with the first two small beds this summer. We won't need a riding mower then, and can probably replace the gas powered push mower with a reel mower for the side yard recreational area. The field you see in the above photos will eventually be fenced and used to grow feed, maybe hay. Obviously we aren't ready for that yet, but it's the plan. Until then, we just keep taking one step at a time. I got a scyth last year. took a long time to get here, so didn't get much practice with it last year. Used it for the first time this year this morning while waiting for the kids to come get me for Mother's Day lunch. It takes some getting used to, and I am by no means an expert, but I do enjoy it. I can listen to the world around me, and my sheep (Romeldale/CVMs) get to eat the results, which they couldn't when we ran the lawn mower. A little extra exercise for me, which can't hurt either! Wonderful! I've always wanted a scythe, but we have no lawn, no grass to speak off. Looks therapeutic, swinging one. I've only one hoe, a thin, "scratchy" European one. I do love weeding with it, just scratching the surface to kill the weeds there and not to bring up new weed seeds. It can't slash through the acorn sprouts, though. Maybe needs a good sharpening! Bettina, I can see how it isn't suitable for small areas. And I agree about the smell of the fuel fumes. yuk! Katrien, it's true, there is something satisfying about hoeing those weeds. 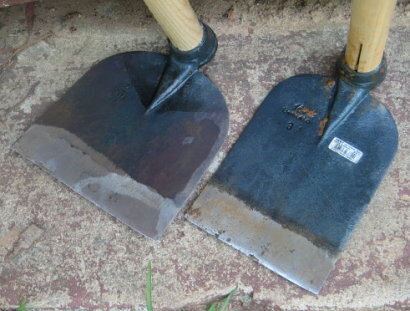 I never realized hoes could be sharpened until we got our two new ones. They sent us a complimentary file simply for ordering two tools. My goats (3 angora does) are always upset if they don't get some of the cuttings too, but they aren't as loud and demanding as the ewes! I haven't had too many problems cutting around obstacles, just change my direction and/or length of swing. Just watched a you tube video where the guy mowed around all sorts of stuff. Dan and I can both relate to your bad problems. He from surgery, me just because standing too long makes it ache. Is your snath an American or European one? Dan is thinking he'd like to try one of those Austrian ones, like they show in most of the YouTube videos. He learned a lot from watching those alone. Not enough space to effectively need or use a scythe. 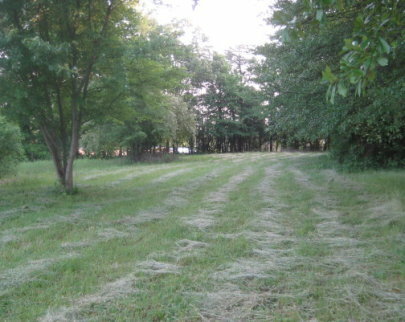 Mainly lawn, though it might be useful to keep the ditch grass down.. that's a pain to mow. I've been using the push mower, still powered, to bag up the clippings for green mulch.. much easier than raking. Still nothing to hoe here yet! I'm turning the soil to keep weeds down, but it won't really be safe to plant much for another couple of weeks. It's weird how early cool weather crops do germinate and start to grow, albeit slowly and seeds planted a month later, catch up in just a few days.. is hardly worth it sometimes to try for an early crop. This year I tried under cover no less! So true. I'm so glad you found the hoes and scyth you wanted. I must admite I haven't used a hoe much since living on the farm and hoeing row after row of sugar beets. YUK!!!! Your hoe and scyth account reads so true to the farmers heart! Good tools are a must and it's really great that someone actually shares where they get them! I'm going straight over to check out the hoes! We use a scyth, too. There are so many times that a machine can't do the job...too big...unbelievable underbrush etc. We have blackberries to contend with and it's not safe using a mower. Nina, we have a mulching mower too, but no bag attachment. You've got me thinking that I really need to get one. Every little bit helps when it comes to mulch and compost. I've been noticing what you say about me seeds too. Not to sure how to get the best and earliest crops for some things yet. I need to experiment more! Barb, I don't mind hoeing short rows, but something like those sugar beets would really take the fun out of it! Flower, those hoes are the best. Heavy, but oh so effective. I'm thinking I need to learn how to use the scythe too. It is a handy tool. They are cute - actually they are rather pretty. Congratulations on getting them. I agree that the right tools for the job makes the job easier. Sara, not sure what's up with that, but I'm glad Blogger let you comment somewhere! Thank you about the goats! We think they're rather pretty too. Benita, that would be the perfect place to use a scythe. We're not so young, but hopefully with routine use, there won't be any sore muscles after scything! Robin, Dan wants to try the European one too. Somehow it doesn't seem as though the Seymour American model is made for actual use. Without being able to adjust the handles, it's hard to get the correct angle of the blade. Still, there's both an art as well as a science to it. Yes, hoes should be very sharp! I think this is the number one reason people hate them. The awful hardware store hoes require extensive work with a grinding wheel to get a decent edge. Then I keep them sharp with a minute or less of filing each time I take them out. A scythe is something that's been on our shopping list for awhile. What recommendations do you have for a newbie shopper? (Where to get, what to look for, etc.) Thank you for all the great info! Lee, yes, you blog lots of helpful stuff! Dan hasn't been too happy with that American style snath & scythe, so we have just ordered a European model from Mystic Prairie. They are the ones with all the good scything videos on YouTube. I'll have to let you know what he thinks after he's given it a try. Jo, what I can tell you about the snath & scythe, is to not get the American style. In order to cut properly, the blade angle has to be parallel to the ground. That can't be done with an American snath unless one is very short. Dan is 5'9" and since the handles aren't adjustable, he can't get the blade at the proper angle. The ones from Mystic Prairie (link above) are sized according to one's height, have a straighter snath, and adjustable handles. He really enjoys doing it, so I hope this one does the trick. I know this is an old post but I'd like to comment that the use of the American scythe is very different from a European one. I have plenty of tips for you if you're interested--it's really an excellent tool once set up properly and you get the technique down, which isn't intuitive. Learn to use it from watching videos for a totally different style of scythe and you're sure to be disappointed! Part of the problem is that modern American-pattern grass blades don't have any "set" or angle to the tang like they should. A straight set is normal on a bush/ditch blade because the stroke is an upward pulling one almost like pulling the woody plant out of the ground and the blade angle allows it to cut at 45 degrees to the grain of growth, which is where it's most efficient. But you want the edge pretty close to parallel with a grass blade. You can solve that problem by wrapping the blade with a wet towel (to protect the heat treatment of the edge) and heating the tang carefully with a torch and bending it to the right angle. Or better yet find a vintage blade with the angle already set properly. The handles (nibs) ARE adjustable on American scythes. The threads are reversed, so it's lefty TIGHTY, righty LOOSEY. This is so the nibs do not work loose during the swing of the cutting stroke. Also snaths used to be made in a range of weights for different tasks. Heavy snaths like the present production Seymour ones were usually intended for use with bush blades and/or cutting resistant targets. Lighter snaths were made for mowing grasses and lush plants. Keep your eyes peeled in antique shops and barns and you may find one or two nicely preserved examples. Fitting the scythe to the body: The first important step to ensure success with the American scythe is to test-fit the snath to your body. Modern snaths produced by Seymour Manufacturing are sized to the average modern man, but many vintage snaths will be on the small side for the taller American of today. Fortunately, the first step of tuning your scythe is very simple and can be performed in the store from which you intend to make your purchase. Adjusting the Nibs: First, check the nibs to make sure they may turn freely. The nut at the top of the nib runs on a left-directional thread, so rather than the old adage “lefty loosey, righty tighty” it’s “lefty TIGHTY, righty LOOSEY.” This is important as you don’t want to make an already tight nib even tighter--especially when rust may be involved. Once the nibs have been freed you may adjust them to their proper position for your height. Stand relaxed with your feet shoulder width apart and the scythe standing upright on its head next to you (blade end on the ground.) While standing thus, bring the lower nib to the level of your hip joint (NOT the highest point of your hips!) and tighten it gently in place. Now rest your elbow on the nib with your fingers outstretched. This marks the position of the upper nib. Now, re-assume the relaxed stance you employed to find the first nib, but now hold the scythe by its nibs at the three o-clock position with the blade resting on its spine. adjust the rotation of the lower nib until you achieve balance in the “rock” of the blade’s spine--i.e. the point where the spine is resting on the floor should be equidistant from the point and the beard. It is important to note that this point DOES NOT correlate with the height of the point and the beard from the ground, as the nose of American scythe blades commonly lift slightly to avoid burying the blade in the dirt on bad swings and to assist with the scooping motion used at the start of the cut. Once this balance is achieved, adjust the rotation of the upper nib to where you are most comfortably able to lift the blade off the ground by pushing down on the upper nib and allowing the lower nib to roll in your hand as a pivot. This initial adjustment is all simply to get you in the ballpark for your particular scythe configuration, and you will likely find yourself making further adjustments while using the scythe for extended periods. Listen to the tool and it will tell you how it wants to be used. Don’t be afraid to experiment with your adjustments! Grass blades: The most common variety. Typically long, thin, and light as a feather. The “run” of the blade (or the set of the web) tends to be either parallel to the ground or only slightly lifted. A blade of this style in medium length will usually be capable of handling everything from fine lush grasses to (with practice) heavier woody plants like goldenrod, but they are more prone to damage than other varieties due to their light build and long blades, which can compound the leverage of a bad cut and damage either the blade or the snath. They are, however, both the most commonly available blade style as well as the most versatile. Bush or Brush blades: These blades are shorter and heavier, with a much broader blade, and are intended for clearing young woody growth ranging from goldenrod, burdock, and thistles up through very young saplings. They are robust in the spine and have a steep upward set to the web to allow the edge to cut with an upward shearing stroke along the grain of growth. Ditch blades: These blades are the shortest and heaviest of the lot with the steepest run of the blade--many times simply having the web set in the same plane as the tang! These work best for the task implied by their name--clearing ditch overgrowth. They are not recommended for anyone not performing a similar task, as they are completely inappropriate for general mowing duties. Once a blade is selected, the mounting process will depend on the collar system used by the snath, but most make use of a loop bolt through which the tang is passed, and a series of holes for receiving the bent end of the tang. These are used for adjusting the hafting angle of the blade, allowing you to make the angle more open or closed. A more closed angle is generally recommended as it minimizes strain on the blade and snath and cuts more aggressively though it narrows the swath of the cut. 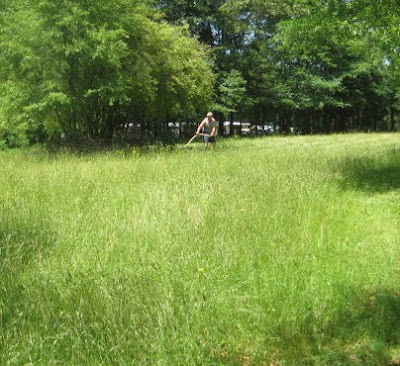 An open angle is used in fine grasses and clear ground, and is advantageous when clearing a large area as it maximizes the reach of the blade. A heavy patch of oiled leather or rubber may be inserted between the loop bolt of the snath collar and the blade tang to provide a more secure fit and prevent wear on the parts. As I have yet to write the section on use, I'll just leave a few quick pointers and a couple of links to some limited resources. The motion is a little difficult to describe. The right hand mostly does the holding, supporting the weight of the scythe and acting as a pivot point while the left hand does the "opening" and "closing" of the "door" created by the space between your hands. The key is to focus on the tip of the blade as it enters the grass at the start of the stroke, and the heel of the blade at the end of the stroke. Reach forward while opening the "door" and bring the tip into the cut as you pull back with the left hand and draw both hands back and to the left, pulling much more with the left hand than the right to "close the door." Thank you for the information and links. Most helpful! My pleasure! I had started off researching scythes years ago and found the same handful of retailers that most have seen singing the praises of the Austrian models and dissing the American pattern. I swallowed the information whole at first...until I started doing a little more research and realizing that Austrian scythes were just the most widely available and had suffered the least from quality downgrades over the years. After all, if the American scythe didn't work well they wouldn't be hanging in every old barn across the nation! I get a lot of readers interested in these kinds of skills. I'll be happy to do my part by doing do a review to publish on my blog! Good grief, that buttercup is indeed out of control. My husband says your youthful wide swing would wear him out, LOL. He prefers shorter swipes, with little hip movement and utilizing mostly arm and shoulder muscles. Your vids are graceful things to watch. The key is that the stroke and the step are linked as part of the rhythm--as I step forward with my right leg I open the swing. My weight is almost all on the right leg at the start, and as I close the stroke I bring my left foot up to square with my right as I almost let my weight "fall" onto the left leg. It's like the right leg acts as a pivot for your weight and you fall forward and back, anchored to that pivot. Almost all of the muscle I use (other than the forearms which support the weight of the scythe) is in my shoulders, hips, and a bit in the biceps. Thanks for the kind words! :) I've sent an email to Seymour seeing if they're at all interested in working with me to tweak the performance of their scythes so they can take advantage of the upswing in the market--hopefully they'll respond favorably! You may find this interesting--it's an image from the patent documents for the fastening system my scythe uses. Quite elegant if you ask me! I hope Seymour is responsive to you. There is definitely a renewed interest in the slower paced skills that are on the verge of being lost.